After hosting a successful series of off-road action events last year, Vaseline Men, the fastest growing men’s skin care brand in the Philippines once again drives you to get more out of life in the 2014 Vaseline Men XTERRA Off-road Triathlon Series happening on March 15 in Liloan, Cebu. Dubbed as the world’s premier off-road triathlon event, the Vaseline Men XTERRA Off-road Triathlon Series in the country serves as one of the qualifying events for the World Championship. The Vaseline Men XTERRA Off-Road Triathlon features exhilarating triathlon races that will challenge even the most seasoned athletes. Aside from winning exciting cash prizes, qualified elite group of finishers can race with other XTERRA record holders around the globe during the world championship in Maui, Hawaii. On its third year, Vaseline Men will again bring triathletes to the pristine waters and rough but picturesque terrains of Liloan, Cebu for a more thrilling set of challenges. The national championship event highlights two race categories, XTERRA Lite and XTERRA Full. The XTERRA Lite involves a 500-meter swim, 15.5-kilometer mountain bike and a 5-kilometer trail run, while the XTERRA Full involves a more grueling challenge with a 1.5-kilometer swim, 35-kilometer mountain bike and a 9.2-kilometer trail run. 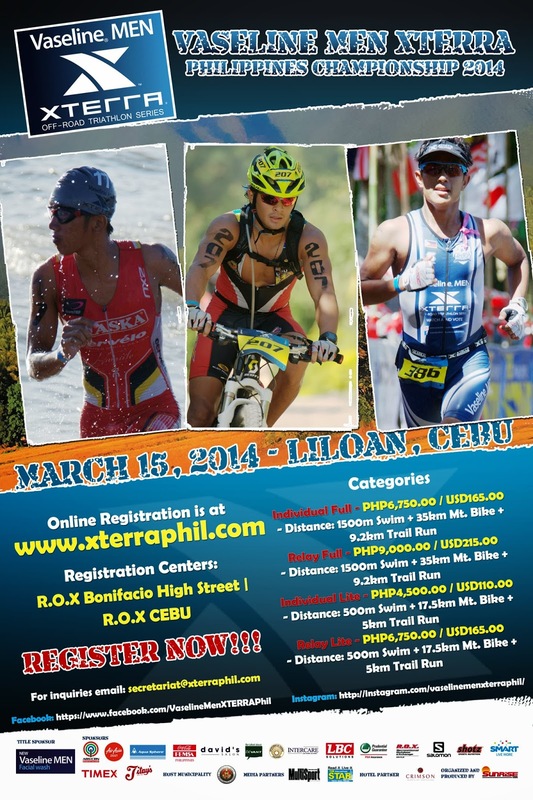 Registration for the triathlon events is ongoing in the Vaseline Men XTERRA Philippines website (www.Xterraphil.com). Vaseline Men offers a wide range of skin care products which are perfect for men who engage in physically demanding activities including triathlons as they help protect the skin from the sun’s harmful rays and wash away dirt, dust and pollution. Included in its range are Facial Washes, Face Moisturizers and Body Lotions. One of its newest products are the Vaseline Men Whitening Anti Acne Face Wash – which fights 7 acne problems for visibly fairer skin. The 7 acne problems that it fights include excess oil, acne, acne marks, clogged pores, blackheads, blemishes and acne causing bacteria. Vaseline Men now also has the new Vaseline Men Whitening SPF 30 Moisturizer perfect for people and young professionals who spend time outdoors so they can stay protected under the sun. Now, Filipino men can conquer their limits through outdoor activities and still get their skin protected from harsh elements from nature especially the sun with Vaseline Men Whitening Anti Acne Face Wash and SPF 30 Face Moisturizers. Vaseline Men is available in all leading men’s zones in major supermarkets, drugstore and department stores nationwide. So this year, brace yourself for a challenging yet exciting summer adventure at the Vaseline Men XTERRA Off-road Triathlon Series. To know more, log on to www.Xterraphil.com or visit https://www.facebook.com/VaselineMenXTERRAPhil. You can also visit R.O.X Bonifacio High Street and R.O.X Cebu to register. The Vaseline Men XTERRA Off-road Triathlon Series is also sponsored by ABS- CBN, Air Asia, Aqua Sphere, Coca-Cola FEMSA Philippines, David’s Salon, Devant, Department of Tourism Philippines, Intercare, LBC Solutions, Prudential Guarantee, R.O.X, Salomon, Shotz, Smart, Timex, Titay’s, and The Municipality of Liloan.